Anyway. Mirror Glazes seem to be pretty trendy lately. You can mirror glaze cakes in all kinds of colors with all kinds of different, beautiful results, and it’s pretty simple and super shiny. I’ll include a recipe for the glaze I used, below. As some of you may know, I’m a librarian by day, and I work in a research library that focuses on the collection of materials (books, newspapers, ephemera, etc.) printed in American before 1876. There’s a lot of marbled paper in our library stacks. Every month, we have a birthday party to celebrate staff who have birthdays that fall within that particular month, and I signed up to bake one of the celebratory cakes for the March party. 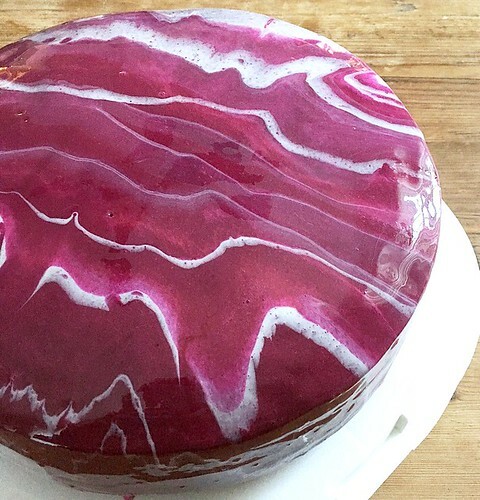 I’d been wanting to try a mirror glaze (I practiced it once before and it went…ok), and it seemed like this was just the occasion to try the technique. 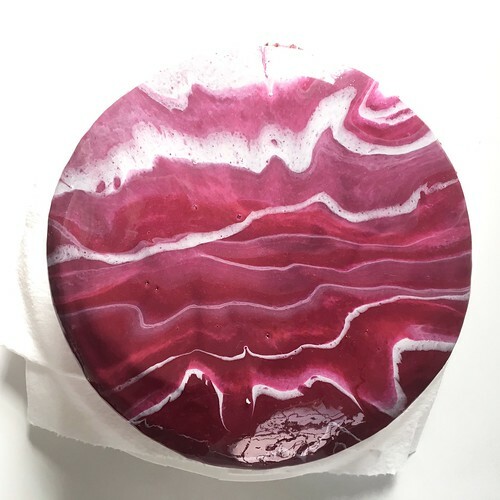 And if I could get the glaze to resemble marbled paper, even better! I baked a chocolate cake with chocolate butter cream frosting and froze it overnight. I used this recipe. The recipe calls for coffee in the mix, which I think makes this particular cake especially delicious! The next morning, when the cake was good and frozen, I got to work on the glaze. Of the two recipes I’ve tried, I like this one best. It requires the use of real white chocolate chips (instead of white chocolate melts that one may be tempted to use) which make a world of difference. Ask me how I know. 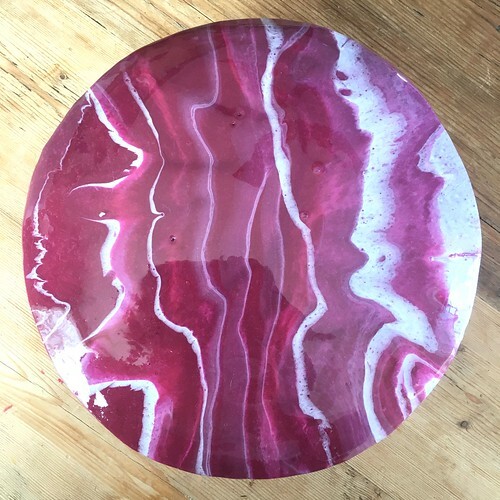 I separated my glaze into three different bowls and colored one white, one a deep burgundy and one a lighter shade of red. I only used a small amount of the glaze for the lighter colors, and colored the bulk of my glaze the darker red, because I knew I wanted it to be the dominant color. I waited for my glaze(s) to reach the correct temperature (also vital…) and then poured them on . First the darkest color, and then drizzles of the lighter colors here and there. The pouring was rather haphazard, intentionally. I ended up with this great, random marbled effect. And it was so shiny! The gelatin in the recipe means that the glaze firms up a bit once it cools completely, so your design stays put. Another word to the wise: transport can be tricky! Make sure you handle with care (aka don’t let the side of the cake hit the side of the cake carrier. You’ll be sorry…Ask me how I know). So, if you really want to wow your friends at a party, I’d recommend a mirror glaze. Mine’s not perfect – there are some air bubbles here and there, and then we had that little mishap during transportation…But it was still a hit! And it’s not hard at all if you’ve got a good recipe! Thanks, Dawn! You’re so kind!